The EL2262 digital output terminal connects the binary control output signals at the process level with electrical isolation. The outputs are controlled with an adjustable, integer multiple (oversampling factor: n) of the bus cycle time (n microcycles per bus cycle). 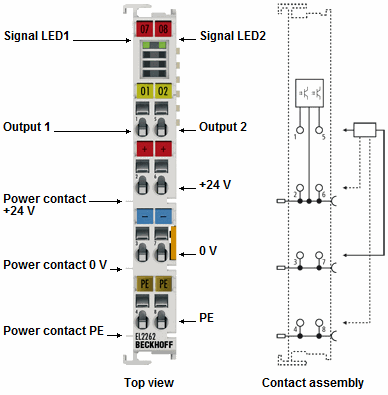 For each micro-cycle, the EtherCAT Terminal receives a process data block that is output consecutively. The time base of the terminal can be synchronised precisely with other EtherCAT devices via distributed clocks. This enables an output pattern with a significantly higher pulse sequence than the bus cycle time, exactly synchronised with the system time base. This procedure enables the temporal resolution of the digital output signals to be increased to n times the bus cycle time. The maximum output rate is 1 Msample/s.